Remco released this puppy way back in 1975! I absolutely love the box art on this. It reminds me of the fantastic Gold Key comic covers. 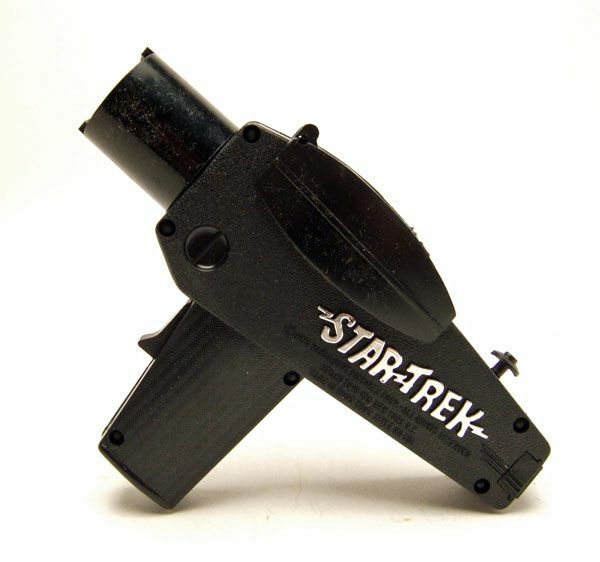 When you first glance at the phaser, sure, it looks a bit clunky and not exactly what you'd call "screen-accurate". 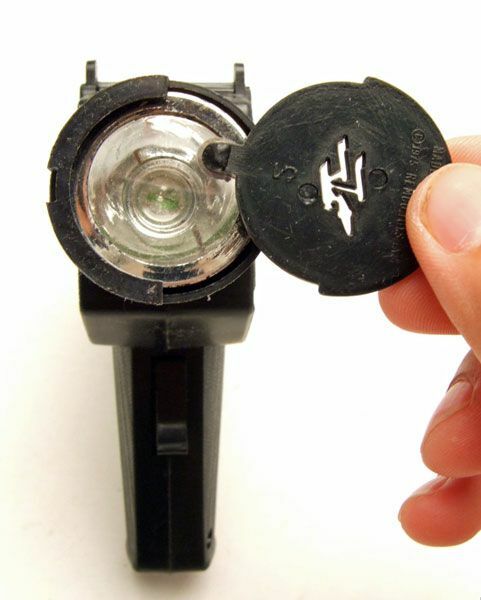 The body's a bit large, the handle's off, the emitter is different, there's a Star Trek logo on the side, etc. etc... But none of that mattered back then. 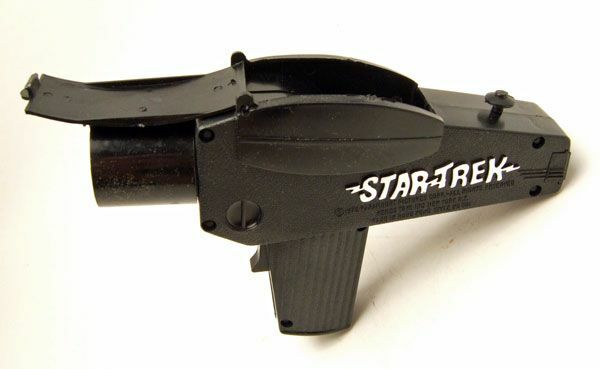 This was a phaser that was made for play, not to sit on a shelf and be admired for it's reproduction quality. Each disk has a little cut-out depicting a different ship. There's the Enterprise, a Klingon Battle Cruiser, and a goofy little generic flying saucer. I LOVED this as a kid oh so long ago. True, it wasn't exactly like the one on the show but who cared? It was FUN!!! Loads of fun. Pity mine didn't survive the endless playtime. I had this sucker back in the 70's too. 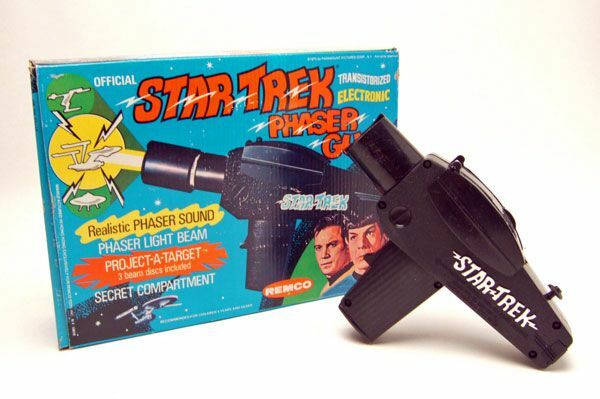 Pretty big for a kid's version ( especially compared to the tiny version included in the AMT "Exploration Set" - which became the model for ALL of remco's replicas ). 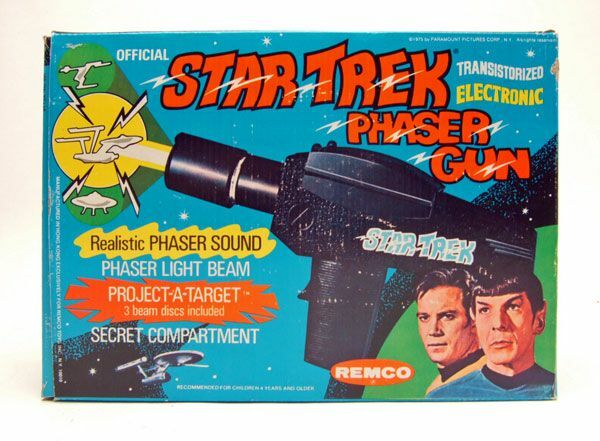 There is one way in which this toy could be considered "screen-accurate": Three of these Remco phasers were used ( with a bit of paint modification ) in "Saturday Night Live"'s hilarious first season sketch, "The Last Voyage Of The Starship Enterprise", starring John Belushi as Shatner/Kirk, Chevy Chase as Nimoy/ Spock, Dan Akroyd as Kelley/McCoy ( and voice of Scotty )/ and Elliot Gould as NBC Executive Herb Goodman. Great Stuff!